Here at Atlas Towing, we take pride in our staff’s immense industry knowledge and the diversity of services that we provide. With almost a century of experience under our belts, we have built and maintained a trusted reputation by keeping clear and consistent intentions: always provide ethical, loyal and reliable solutions to the San Francisco Bay Area and beyond. 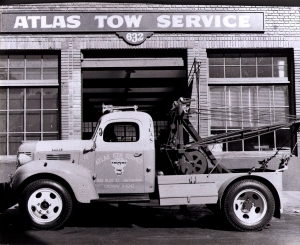 While other companies continually struggle to match our tenured staff’s experience and expertise, Atlas Towing is able to develop long-term relationships with clients by providing superior service and ensuring safe, quality work. We take great pride in what we do, and we are committed to getting you back on the road as quickly as possible. Have you ever been stuck in an auto emergency, such as a flat tire, dead battery, or an empty gas tank? At times, a car simply won’t start for a variety of reasons, including mechanical. Thankfully, we are always available to take your call with our around-the-clock roadside services. At Atlas, we are well aware that accidents are unpredictable and tend to occur at the most inopportune times. That’s why we assure our clients that, day or night, our committed dispatchers and drivers will always be ready and willing to assist in time of need. In our commitment to continually exceeding expectations, we operate a full-service company that’s here to serve all of your towing and roadside assistance needs. With a fleet of new, clean, and large tow trucks, we’re able to efficiently tow any vehicle—from a small scooter to a tractor-trailer. Additional services we provide include roadside assistance, battery replacement, private property towing, and overnight storage of disabled vehicles. To ease your job in finding a towing company in the Bay Area, we strategically position ourselves to service the San Francisco Bay Area, including both East Bay and South Bay. Our live, in-house dispatchers are, quite simply, the representatives of our company. To make the best first impression and to serve your unique needs, our team is focused on providing individualized attention to each of our customers, every time the phone rings. Our highly trained and experienced dispatchers quickly ask for an explanation of the breakdown, and then a driver will immediately be in route to your location. Even more, our team will provide an estimated time of arrival, as well as a quote for the service that will be offered. In addition, we vigorously train our drivers in proper towing and recovery techniques, in order to prevent our customers’ vehicles from any potential damage that may be incurred during the traditional towing process. Furthermore, our drivers are educated in common roadside service with hopes to quickly get our customers’ vehicles moving again. Though we put a strong focus on our prompt assistance, our team refuses to allow our expedient service to hinder the quality of our care. Our drivers stick to our long established principle that excellence and safety must always come first. With Atlas, there’s guaranteed customer satisfaction. Don’t take our word for it though—take theirs.